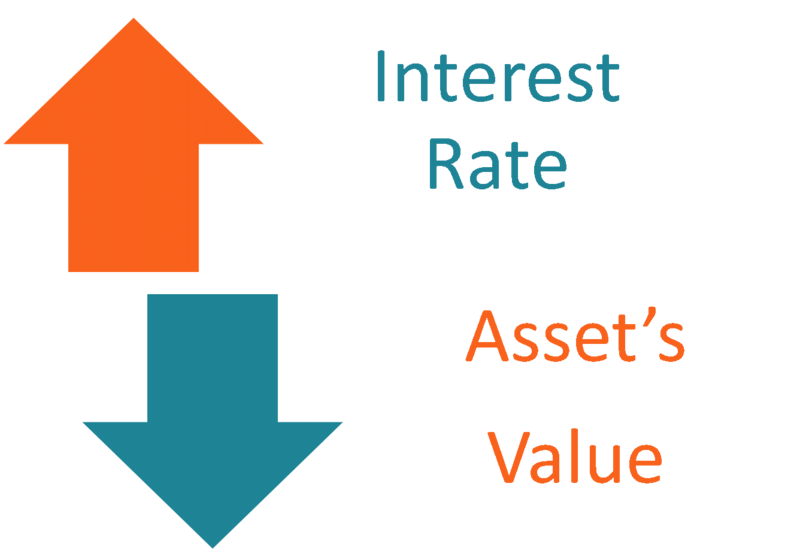 Interest rate risk is the probability of a decline in the value of an asset resulting from unexpected fluctuations in interest rates. Interest rate risk is mostly associated with fixed-income assets (e.g., bondsBondsBonds are fixed-income securities that are issued by corporations and governments to raise capital. The bond issuer borrows capital from the bondholder and makes fixed payments to them at a fixed (or variable) interest rate for a specified period.) rather than with equity investments. The interest rate is one of the primary drivers of a bond’s price. The current interest rate and the price of a bond demonstrate an inverse relationship. In other words, when the interest rate increases, the price of a bond decreases. The inverse relationship between the interest rate and bond prices can be explained by opportunity risk. By purchasing bonds, an investor assumes that if the interest rate increases, he or she will give up the opportunity of purchasing the bonds with more attractive returnsRate of ReturnThe Rate of Return (ROR) is the gain or loss of an investment over a period of time copmared to the initial cost of the investment expressed as a percentage. This guide teaches the most common formulas for calculating different types of rates of returns including total return, annualized return, ROI, ROA, ROE, IRR. Whenever the interest rate increases, the demand for existing bonds with lower returns declines as new investment opportunities arise (e.g., new bonds with higher return rates are issued). Although the prices of all bonds are affected by interest rate fluctuations, the magnitude of the change varies among bonds. Different bonds show different price sensitivities to interest rate fluctuations. Thus, it is imperative to evaluate a bond’s duration while assessing the interest rate risk. Generally, bonds with a shorter time to maturityBond PricingBond pricing is the science of calculating a bond's issue price based on the coupon, par value, yield and term to maturity. Bond pricing allows investors carry a smaller interest rate risk compared to bonds with longer maturities. Long-term bonds imply a higher probability of interest rate changes. Therefore, they carry a higher interest rate risk. How to Mitigate Interest Rate Risk? 1. DiversificationDiversificationDiversification is a technique of allocating portfolio or capital to a mix of different investments. The ultimate goal of the diversification is to reduce the volatility of the portfolio by offsetting the losses of one asset class by the gains of another asset class. If a bondholder is afraid of interest rate risk that can negatively affect the value of his portfolio, he can diversify his existing portfolio by adding securities whose value is less prone to the interest rate fluctuations (e.g., equity). If the investor has a “bonds only” portfolio, he can diversify the portfolio by including a mix of short-term and long-term bonds. The interest rate risk can also be mitigated through various hedging strategies. These strategies generally include the purchase of different types of derivatives. The most common examples include interest rate swaps, optionsOptions: Calls and PutsAn option is a form of derivative contract which gives the holder the right, but not the obligation, to buy or sell an asset by a certain date (expiration date) at a specified price (strike price). There are two types of options: calls and puts. US options can be exercised at any time, futures, and forward rate agreements (FRAs). DiversificationDiversificationDiversification is a technique of allocating portfolio or capital to a mix of different investments. The ultimate goal of the diversification is to reduce the volatility of the portfolio by offsetting the losses of one asset class by the gains of another asset class. Floating Rate NoteFloating Rate NoteA floating rate note (FRN) is a debt instrument whose coupon rate is tied to a benchmark rate such as LIBOR or the US Treasury Bill rate. Thus, the coupon rate on a floating rate note is variable. It is typically composed of a variable benchmark rate + a fixed spread. Value at Risk (VAR)Value at Risk (VAR)Value at Risk (VAR) is a financial metric that estimates the risk of an investment. More specifically, VAR is a statistical technique that measures the amount of potential loss that could happen in an investment portfolio over a specified period of time.